"This is a very easy, delicious appetizer. A creamy mixture flavored with onion is spread on white bread and rolled with a crisp baby dill pickle. I usually at least triple the recipe for parties, because it disappears quickly." In a medium bowl, mix cream cheese, mayonnaise, onion juice and grated onion. Spread the mixture thinly on the white bread slices. Roll 1 baby dill pickle in each slice of bread. Place in a medium glass baking dish with the seam side down. Cover and chill in the refrigerator 8 hours, or overnight. To serve, slice each bread roll into 1 inch slices. Batter up your dills, and fry them to a deliciously crispy, golden-brown. This recipe is so easy to make. I ended up rolling the bread with a rolling pin to make it flatter and then spread the cream cheese mixture. What wonderful fast and tasty appetizers! Instead of bread try ham, I know it's a little different than what the recipe calls for but it is delicous. It has been a while since I made this, but they are great. 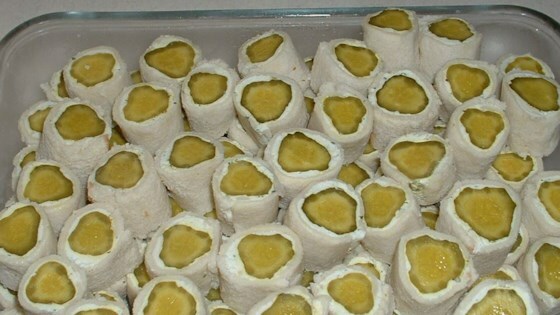 If you have pickle lovers around they will quickly disappear. You can also use dill spears and tortillas instead of bread.